I have loved photographing one old, weathered tractor for years. It sits in a field that is home to horses now and I think it has been enjoying its retirement there for many years before I ever found it. For the first time, I met the gentleman who owns this tractor, the horses and the land this past weekend. 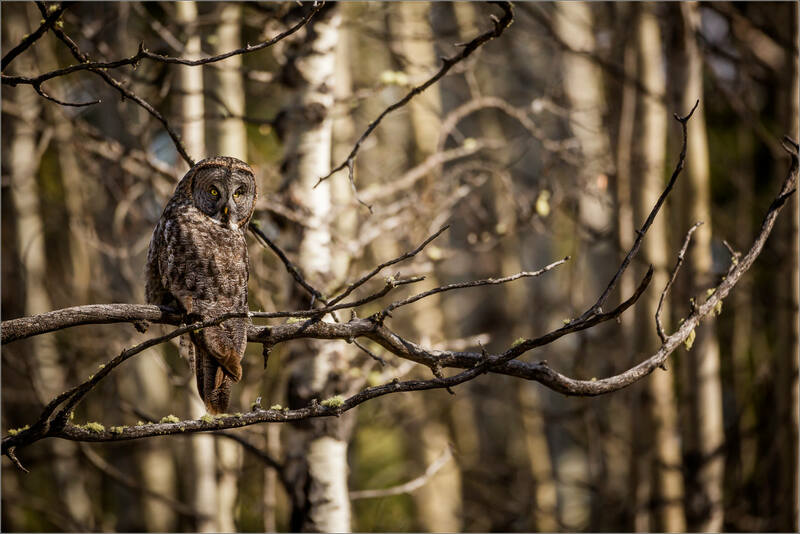 We had a pleasant conversation while we enjoyed watching this Great gray owl hunting along his fence line. Peter was very familiar with this owl and it was great to learn some new things about it. 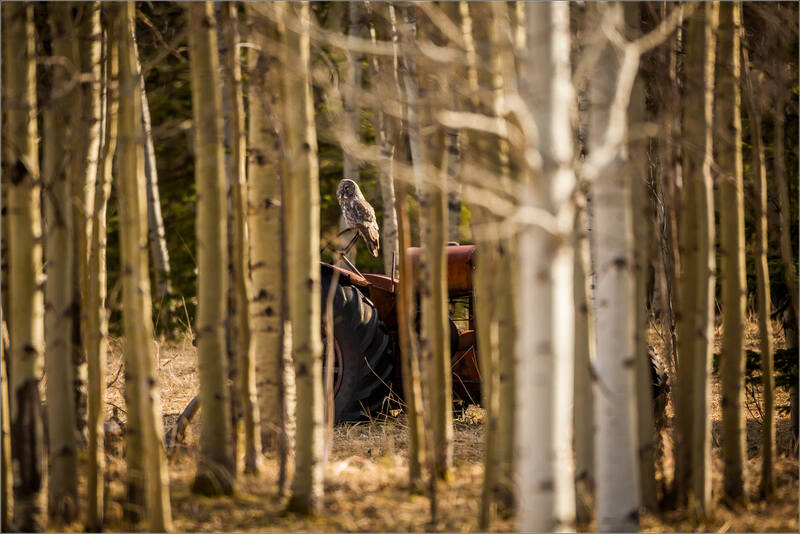 Shortly after he left, the owl flew off the fence line and into a stand of trees near the tractor. 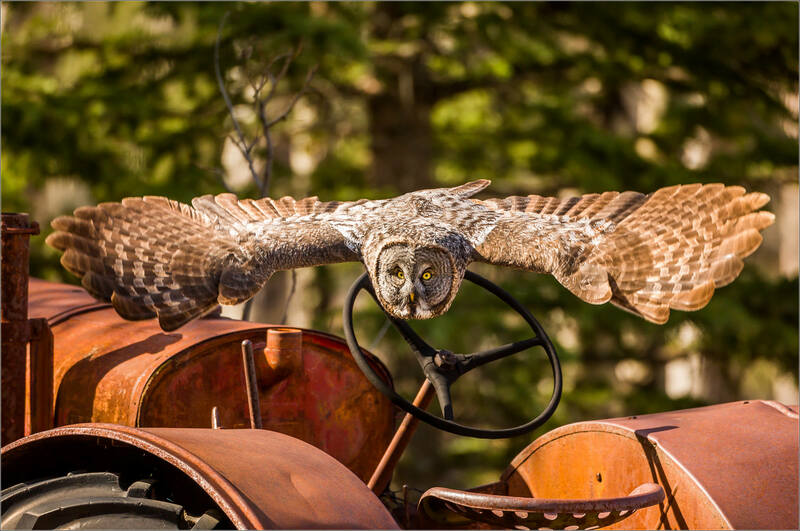 I set up for a dive I hoped would come but was very happy when the next flight was not into the grass but over to the steering wheel on this much admired, at least to me, tractor. 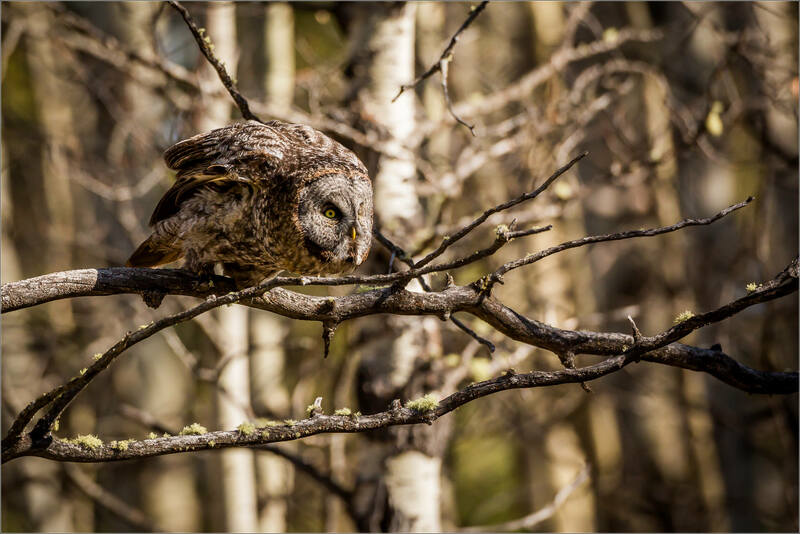 From this perch, the owl’s glowing eyes scanned the surrounding grass. After a few minutes it hunched down, signalling that it may fly. It paused for a couple of seconds and then launched. This bird is an excellent hunter so it was no surprise that the strike was successful. 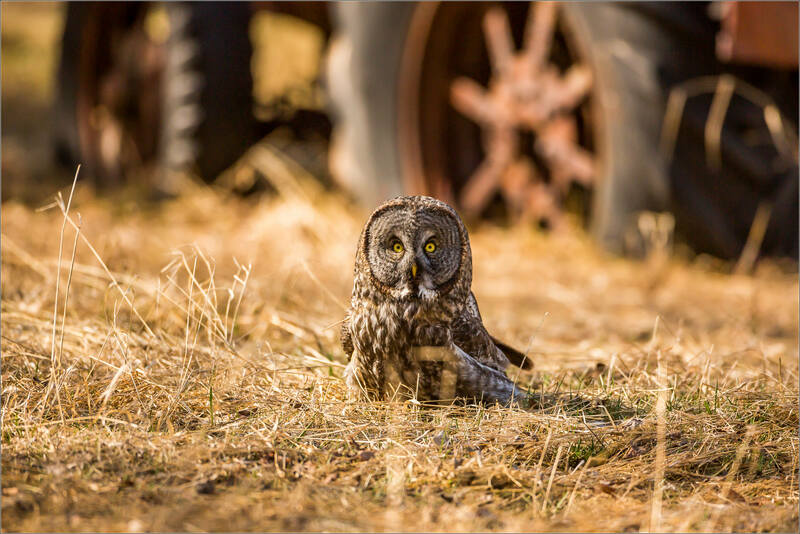 As they like to do, after the pounce the owl looked around to check his surroundings as they are vulnerable when down on the ground. It stared at me to check that I hadn’t made any moves or movements that signalled a change in my intent. It swallowed the mouse on the ground and then flew back to the same perch on the tractor. It idled on the wheel for a couple of minutes, preoccupied for a moment with something it noticed in the sky above, before heading into the trees. These were the trees where I had gone into when I was photographing him on the tractor so I had a front row seat to the forest hunt and three different perches before he flew uphill and out of sight. 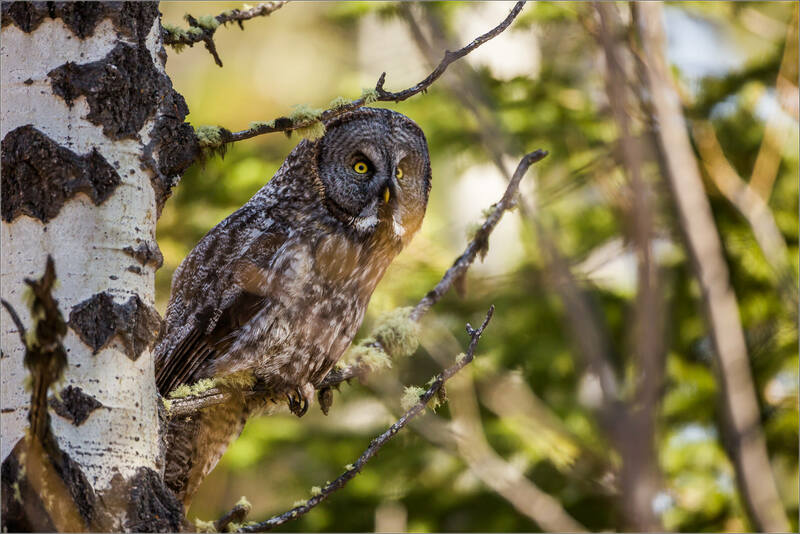 This entry was posted on April 27, 2015 by Christopher Martin. 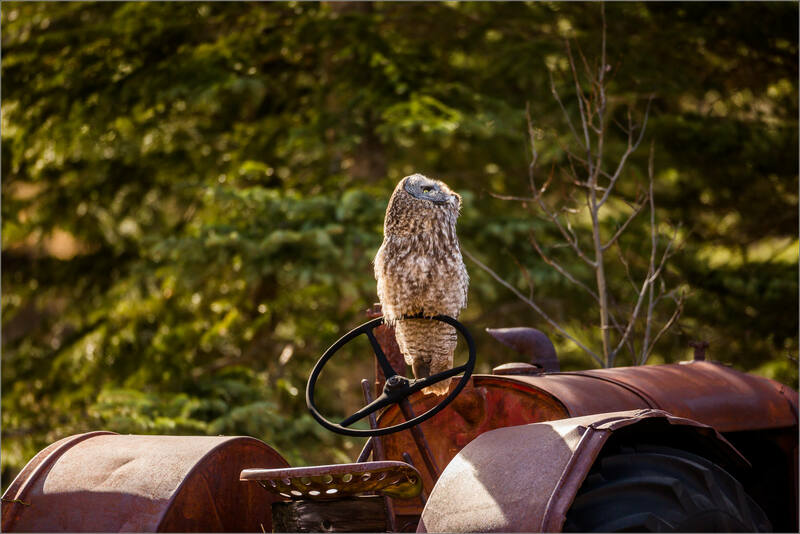 It was filed under Bragg Creek, Nature, Owls, Wildlife and was tagged with bird, bragg creek, Canada, farm, Great Gray Owl, nature photography, owls, strix nebulosa, tractor, wildlife. These are soooo cool! 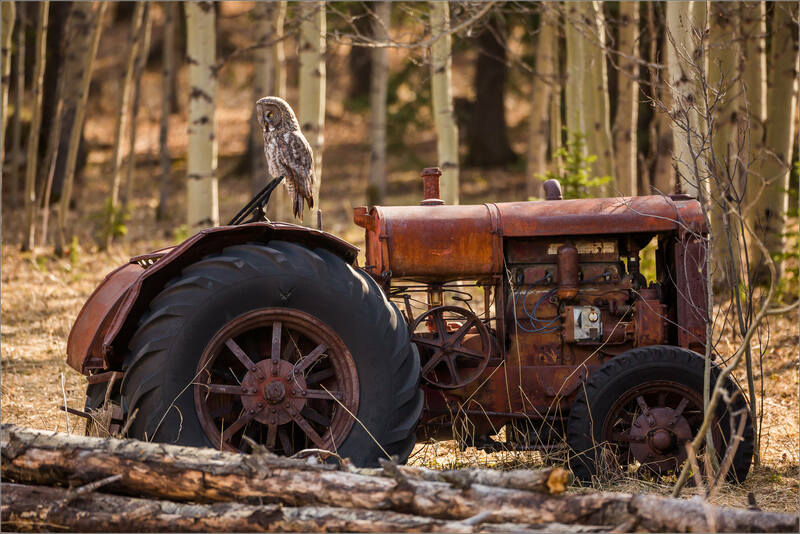 I love the tractor and the owl separately but together super amazing! You must have been over the moon to get these great shots. 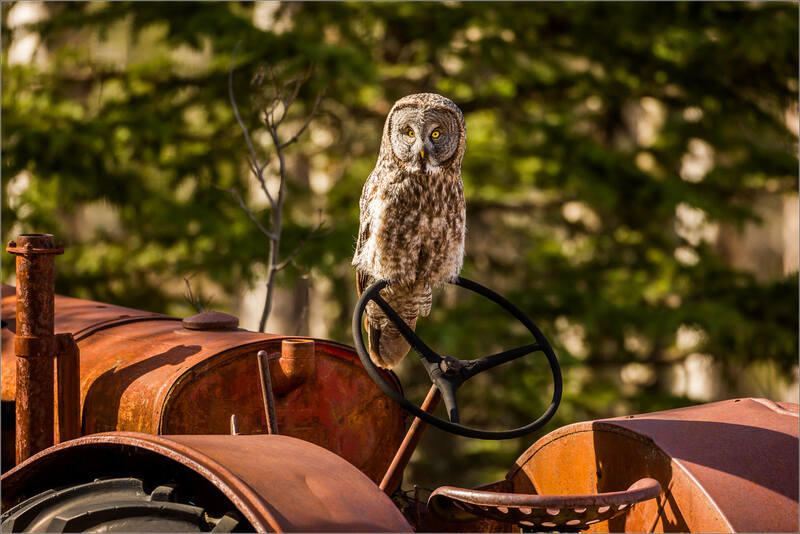 The ones with the owl on the tractor steering wheel are really neat. I’d say you were in the right place at the right time. Thanks for sharing. Spectacular! The tractor adds such a great dimension to the photos. 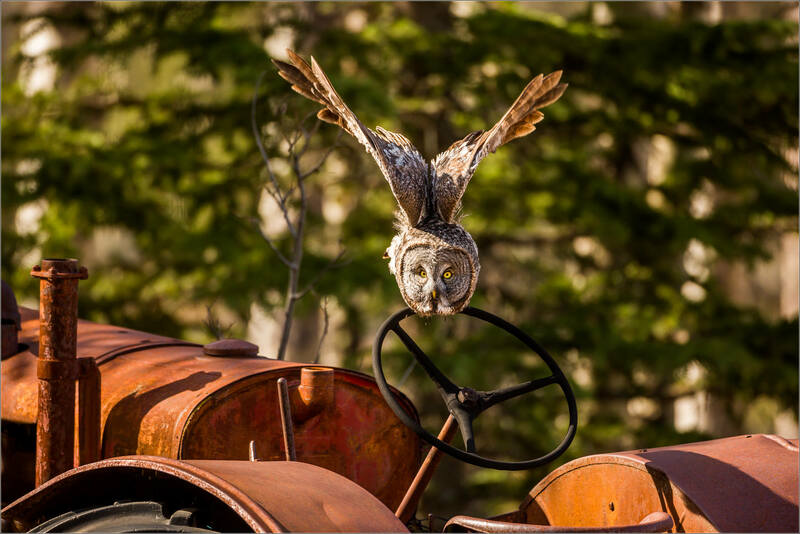 I especially love the one of the owl in flight right over the steering wheel. As always, your posts are something I look forward to! Thank you – I’m glad you enjoyed them! Have a great day.